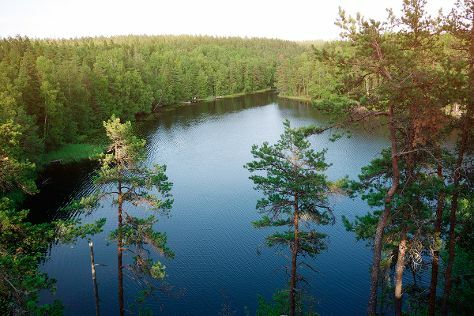 Get outdoors at Nuuksio National Park and Teijo national park. Museum-lovers will appreciate Sea Fortress Suomenlinna and Seurasaari Island and Open-Air Museum. Get out of town with these interesting Helsinki side-trips: Jarvenpaan Taidemuseo (in Jarvenpaa), Porvoo (Nasin Kartanon Galleria & Brunberg Candy Factory Shop) and Sipoonkorven Kansallispuisto (in Vantaa). Next up on the itinerary: hunt for treasures at Market Square Kauppatori, stop by Artisaani, take a stroll through Katajanokka, and browse the different shops at Kamppi Shopping Centre. To see reviews, traveler tips, more things to do, and more tourist information, go to the Helsinki trip planning site . If you are flying in from United States, the closest major airport is Helsinki Vantaa Airport. In June in Helsinki, expect temperatures between 65°F during the day and 50°F at night. Finish your sightseeing early on the 11th (Tue) to allow enough time to travel back home.